When one gets a new gizmo, there is a strong tendency to gravitate towards using it all the time...it's only natural. I would have to say that the Trimetric has had a bit of this effect on me...I just have to press that little button to open up the new world of information it has to offer. This is not a bad thing mind you, I have a much better understanding of what is going on with the state of our solar/battery setup than I ever did before. Once I got past the fascination with the raw data, it was time to put it to use to figure out exactly what each 12 volt device in the Alto costs, in terms of impact to the battery. Energy conservation while off grid is a bit of a pursuit of ours, so knowing what the real loads are will be great. So I began an energy audit, and along the way, learned a little bit more about how some devices actually work. First I put together a list of the devices that run on 12 volts, or have a 12 volt component in their operation, such as the 2-way fridge. It may be propane and electric, but the overall operation is controlled by a 12 volt circuit board. Same goes for the water heater. There are a surprising number on board, 19 unique devices in our Alto, not double counting any of the similar light fixtures. Once I had the list, I then set about to determine the amp hour draw of each one. This involved turning devices on one at a time, and recording the draw as measured by the Trimetric. With the display off, the draw of the Trimetric is .01 amps. This came right from the spec sheet, as with no display, how would you get this info? With the display on, the draw is .03 amp/hr. This became the phantom draw to be removed from each reading taken. Next up were the detectors, of which our Alto has the two separate units, LP & CO. As they are both on the same circuit, it was easy to find the combined draw. I might add that all this detective work was done well after darkness had fallen. I wanted to completely eliminate any residual power generation from the solar panels. The amp/hr calculations done by the Trimetric are based on what is going in & out of the battery. If there is a bit of solar amps going in, then the reading of a device’s draw will be skewed by this positive value. This also fluctuates, as the Trimetric is sensitive enough to pick up the solar output changes caused by even a tiny little cloud. After dark, I know the readings are truly for the device draw, with no other influences. From there, it was just a matter of putting the various devices into use one at a time, and watching the Trimetric calculate the negative impact on the battery. Pretty straight forward stuff, or so I thought. I had assumed that once the detectors were on, that was the draw. Not so. While I was finding the draw for one of the LED lights, I saw the amp display move from a stable value, and jump up a fair bit. There was nothing else on, other than the detectors, so it was a tad puzzling. A bit later, the draw dropped back down to what it was when the light went on. I turned the light on and off, and monitored the draw further...sure enough, up it jumped again. I timed the on/off cycles. It was soon clear that one of the detectors was "sniffing" the air on a regular 1 minute on, 1 minute off cycle. Based on this, the phantom draw of the detectors was certainly more than I first recorded, and you would be surprised how this changes the calculations over a 24 hour period. The fridge has a cycle as well. There is the control board, and then when the fridge is called upon to cool, there is a little solenoid that opens to allow the propane to flow for the cycle. Holding that solenoid opens makes up the bulk of the draw, and needs to be factored into the amp/hr cost. Once everything was mapped, I created a little spreadsheet (of course) that would calculate the draw of each device, over different periods of time. Anything with a phantom draw as well as a functioning draw is calculated over a 24 hour period, and this required some adjustments to blend the amp/hr rate. Yes...this is all very geeky. The chart is pretty interesting, especially when you start to play with the amount of time that a device is running in a day. Take the water pump, a huge amp hog, but then look at how long it actually runs in a day. Even including the possibility of a Dale outdoor shower, would that pump run 10 minutes, 15 perhaps, in a day. This works out to about 1 amp a day. Now look at those little detectors, no motor in them, yet over the 24 hours they are on, they eat over 3 amps! Now who is the power hog??? But that's not to say those are not worthwhile amps, and certainly not going to try to save any there. When trying to figure out just how many amps were being used in a day, I think there are a couple of groups, what I call the driveway and camping core draws. These are consumptions that are just simply going to be there, regardless. The driveway consists of the Trimetric and the detectors, and over a 24 hour period, adds up to over 3 amps. I've heard some people pull the fuse on their detectors at times, but I'm just not comfortable with that, even if it is just simply sitting there, waiting for the next adventure. The core camping draw are the same devices, but adds in the fridge and water pump. If you are out, you are pretty much using these, and they are pulling amps out of the battery. I'm sure you could find some savings if you are able to adjust the temp of the fridge, or even turn it off, but for the sake of not getting too crazy with the calculations, I'm assuming a relatively normal manner of operations. From there, I used this core group and came up with a couple of scenarios, to try and estimate just how much we may be using. These definitely lean towards conservative consumption. You can see how it could be very easy to use up all your available amp hours, as devices go on, it add up quickly. If you are out for a while off grid, you also have to keep in mind that you need to replace the amps you take out, and this requires good solar conditions...which means lots of sunlight. As well, from what I have read, the amp hours come out of a battery a lot easier than they get replaced, which is probably the main reason I upgraded the solar controller, to make sure this process was as effective as it could be. So after a few outings with the new solar components, am I satisfied it has been a good investment?Most definitely! Not only do I know exactly what is coming and going from the battery, I know that the battery is being charged as effectively as possible. Can I quantify this. I think so. The battery recovers its charge a little faster, from the parameters programmed in it is certainly fully charged, and when I initiate an equalization phase, I know I am prolonging the overall battery life as per Trojan specs. Sounds pretty good to me. I would certainly recommend the additional of a Trimetric monitor for those planning on a lot of off grid camping. It really helps you know exactly what the battery state of charge is. Have a look over the chart, and although some of the equipment in the Alto has changed over the years, it will give you a high level picture of how amp hour usage can accumulate over the course of a day, and how your own camping style will impact this. The raw numbers are there to help you calculate your own scenarios. Pretty interesting stuff. That is really great info to have. It was interesting to track and discover these numbers. Can't say enough about how cool the Trimetric is. Hi! Not a comment about this specific thread, but two big thumbs up for your whole blog. A month ago my wife and I placed an order for an Alto 1723- the hard part now is waiting another 14 months to take ownership. I don't know how I stumbled onto your site, but I really appreciate all the effort you've put into it. There is a treasure of information here, and I really like your philosophy: "Overkill...Why?.. Because I can!" A person after my own heart! I hope you keep on posting often- Other than the Alto Caravans facebook site, I haven't found any other Alto-related sites, and I need something to help sustain vicarious enjoyment of an Alto until we can finally take possession. Glad you are enjoying our blog. It's very exciting to have an Alto on order. You will not regret it. As you are on FB and looking for more Alto info, you must search for the "Altoistes" group, which is dedicated to all things Alto. Tons of information there, and lots of great people to chat with. Be sure to look it up and join us. The wait for yours may seem long, but it will pass by quickly. Good information! We pick up our 1713 next spring and you have given me lots of ideas for upgrading the electrical system! What size fuse are you using on the battery terminal fuse that you installed? 40 Amps? I'm thinking 100Ah Li-Ion battery, hooking up solar panels in series and installing Victron 75/15 MPPT controller, and installing Victron battery monitor and MPPT monitor in the same place you installed the Trimetric monitor in your modification. I think I will use DC circuit breakers mounted in the baby CB box that Midnite Solar sells. I'm a little worried about temperature issues with the Li-Ion battery, so I would like to build a battery box that can be insulated and even vented with a small computer fan if necessary. I'm not getting the Caravan Mover so the money saved will go to fund this project! It's pretty exciting to be in the queue for an Alto delivery, the winter will just speed by now. I used a 60 amp terminal fuse, based on our current draws, this should provide plenty of protection. If you are contemplating lithium batteries, you will certainly want to research controllers that will work the best with the lithium battery management system. Lithium's are a different charging animal than the standard lead acid, so best to make sure all the components work well together. You may also want to crunch the numbers in terms of wiring them in series. I'm not certain of the value with only 2 panels, but that's where the analysis comes in. Temperature is a factor with these batteries as you mention, and most installations I've read about seem to be inside. Keep in mind as well that with a new Alto, you will be under warranty, so you may want to wait a bit, not only to see how you actually end up camping with the Alto, and how the stock solar works out, but also minimizing any warranty impacts your alterations may incur. Food for thought. Have you discovered the "Altoistes" Facebook group yet? I suspect you would enjoy all the information found there. Check it out! Ok so you are a huge dork. Can I please join your club? :-) Thanks for this info. Any idea where to find the AH draw from a 12v compressor fridge in the Alto? Good one! I am a big believer that it takes one dork to recognize another. Yes, there is lots of room in the club. On the Altoistes FB group, I saw a post recently by Annie where she has done an audit with the Trimetric on her 1743, including numbers on the 12v fridge. Check it out! I prefer Nerd. A Dork is nothing like a Nerd. A Dork doesn't have any expertise in anything. Good point Ralph...there is a difference. 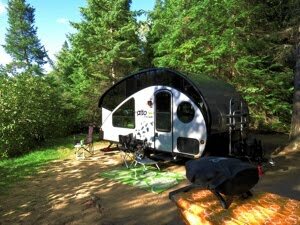 A journal of the adventures we have with the Alto, our very cool teardrop trailer. It started on paper, but a blog just seemed to be an excellent way to record and share our travels.